This week I learnt to embroider using the sewing machine. I had done this once before in about 1985 when a college project required an embroidered waistcoat. The only stitch we were allowed to use was the zig zag stitch. 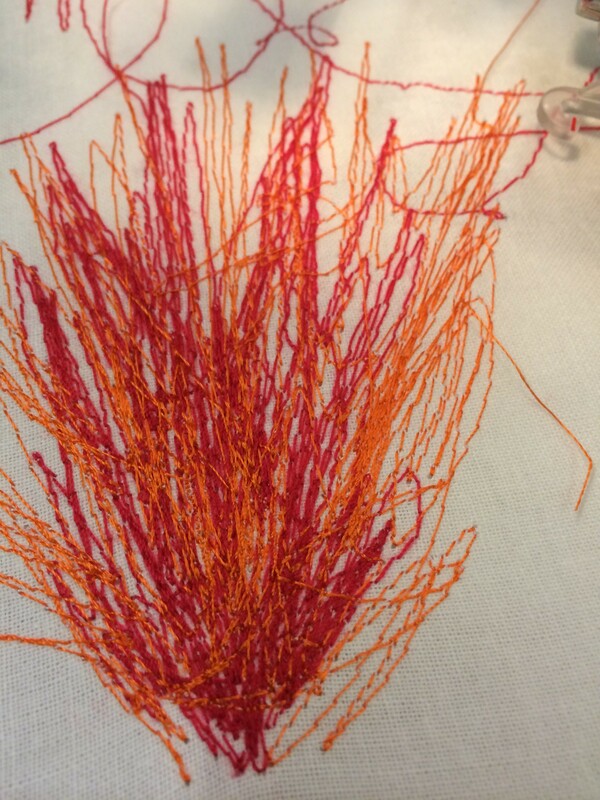 Using brightly coloured embroidery threads the students got some very nice effects. This week I learnt a different, and equally effective technique. I will outline the steps I took. Thread up the machine with white (assuming this is the colour of your cloth) on the spool and the embroidery thread on top. I bought these on eBay for around £2.50 areel. The colours are nice and glossy. 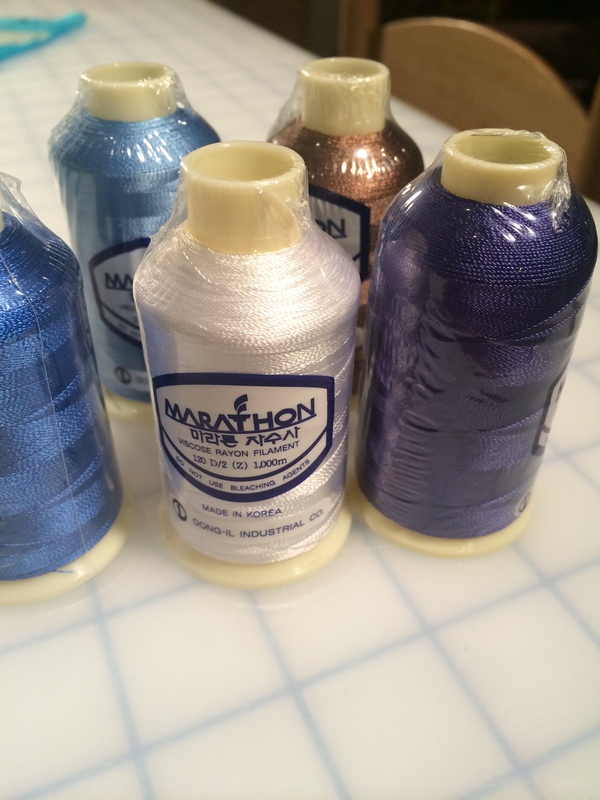 if you want to use metallic threads it is better to thread the spool and work upside down. In my art work piece some of the black lino ink had come through on the area where I had hoped to do the embroidery. 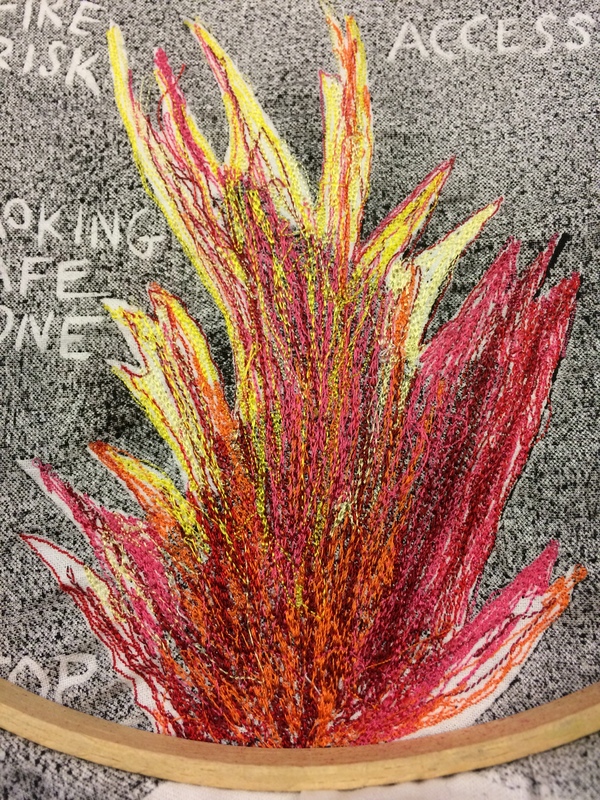 I actually think it works well to help it look more like a fire. I used maroon, red, pink, orange, dark yellow and light yellow to create this effect. I had not done machine embroidery for around 30 years and I realised how satisfying and interesting it might be. I hope to finish my art work next week, but I shall return to this technique when the SWAP is over as I think it could offer some amazing effects. Anyone used machine embroidery in their clothes making? Any tips or suggestions? Oh yes! Thank you very much for this Jane. I remembered Oopbop had had her portrait done by Harriet Riddell! What skill. Inspiration indeed! Really neat! I have never tried this – not sure I am artistic enough to get it right. Good work! Now that’s a fire! Nice work. I’m very curious to see the completed art work. I used to like doing hand embroidery but have never tried doing it by machine. I used to teach machine embroidery but with computerized machines. 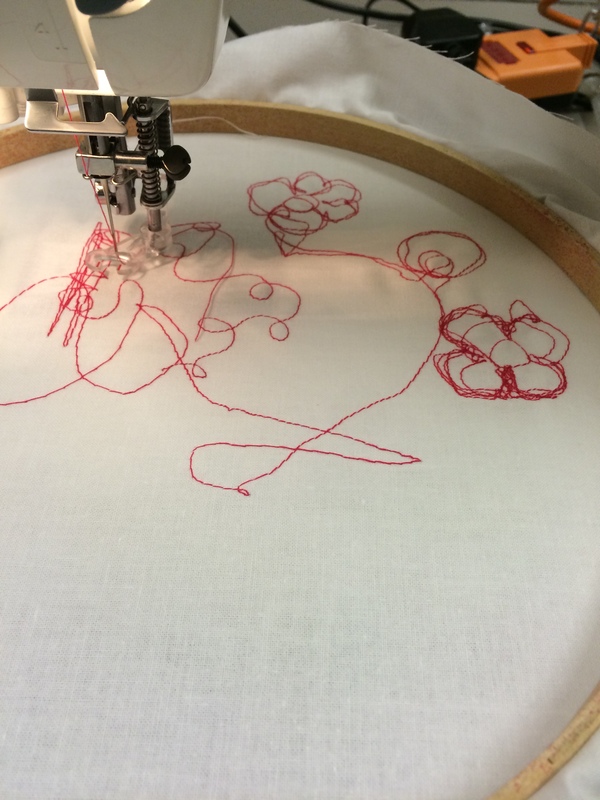 Using tearaway stabilizers and washaway topping can make some embroidery have the least amount of problems. Good luck! Thank you Mrs M. I was impressed by some of the effects you were able to get on denim shirts – really beautiful. It is a nice way to get a flash of colour into something. My teacher showed me the effects of using materials that then dissolve in water. They were amazing – especially trapping in some ribbons and fibres. What a nice craft. Its been a while since I have done any , but it is such fun isn’t it?